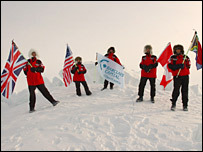 A team of Polar explorers led by a Sussex man have broken the world record for reaching the North Pole on foot. The five-strong team, led by Tom Avery from Ticehurst reached the pole at 1432 BST on Tuesday, 36 days, 12 hours and 11 minutes after leaving Cape Columbia. Their achievement matched that of Commander Robert Peary, who took 37 days to reach the North Pole in 1909, but whose time had been questioned. Mr Avery's team included George Wells, a property developer from Suffolk. At 29 years of age, Mr Avery has also become the youngest Briton to walk to both the North and South Poles. His journey to the South Pole in 2002 also broke the record for fastest on-foot expedition. His team, whose other members were from South Africa, the US and Canada, used equipment similar to that used by Commander Peary in 1909, with replica wooden sledges pulled by Canadian Eskimo dogs. Mr Avery had been keen to prove wrong sceptics who said it would not have been possible for the 1909 explorers to reach the pole in 37 days. 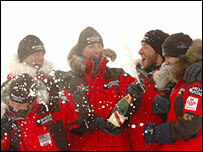 The fastest proven journey to the pole since then had been by a Canadian team which took 43 days in 2000. The expedition saw them cover 423 nautical miles, over ice ridges up to 30ft high and in temperatures as low as -40C, equivalent to -55C with wind chill. Speaking from the North Pole, Mr Avery said: "We are just so unbelievably excited to be here and even though it's been the longest and possibly the hardest 37 days of our lives the journey has left us literally feeling on top of the world. "We have always believed that Peary was one of the greatest explorers of all time and hopefully our re-creation of his journey will silence anyone who doubted this and put the controversy to rest once and for all." The team, who have been promoting the London 2012 Olympic bid, raised the flags of the UK, US, Canada, South Africa and of the Nunavut Inuit people.